Located on the south shore of the wide mouth of Souda Bay, 24 km east of Chania, Almyrida takes up a couple kilometers of beachfront. Once a sleepy village, Almyrida has seen a great deal of development of late, as resorts have been built and Northern Europeans have bought houses and property. Almyrida's 3 beaches are divided by small headlands, a little like a lower case "w" with 3 legs- what you might call a "triple-u" instead of a "double-u." Despite the development, Almyrida retains a pleasant, laid-back feel of the fishing village it is. Heading west, the first two beaches are the more popular. They feature golden sands which slope gradually into Blue-flag-clean waters, making them safe for small kids. These beaches are well-organized. The third beach, with pebbles, is good for snorkeling. The sometimes brisk winds are ideal for windsurfers, as well. Windsurfing lessons are also available to the uninitiated. There are boats for rent, for those able to use them, which makes the sea caves along the coast east of Almyrida accessible. Day trips to Chania, a half hour away, are possible with the excellent KTEL inter-city bus system, which makes Almyrida a potentially cheaper place from which to see all there is to see in Chania. 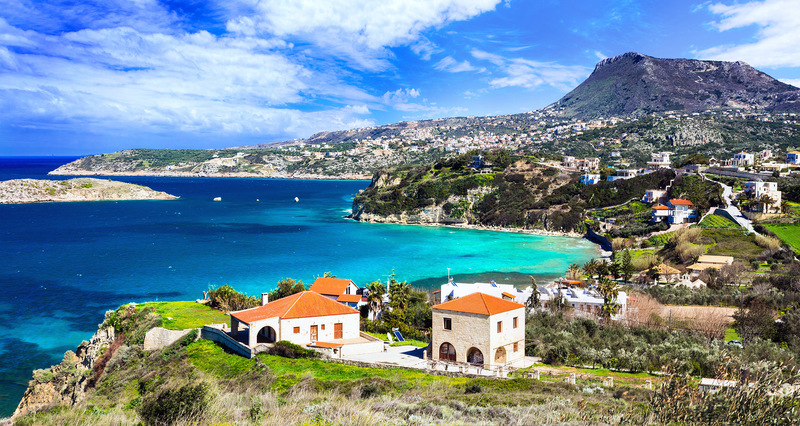 Almyrida's location is especially beautiful, with the waters of Souda Bay to the north, and the often snow-capped peaks of the White Mountains to the south. Almyrida is a relatively quiet place. If you want a little night life, Georgioupouli is about 15 km down the road towards the east.